Geosimulation is the term coined by Benenson and Torrens (2004) in their book of the same name to describe a class of simulation models that focus exclusively on systems whose structure and function is dominated by geographical (or spatial) representations and processes. In fact, this term might cover all models of spatial systems but the focus is restricted to representations characterized by elemental objects ranging from individuals, in the literal sense, in human systems, to automata, in the virtual sense, in computer systems. Furthermore, these objects, which are often called agents or cells, embody explicit behaviors that need to be simulated. In this sense, they intrinsically reflect the notion of change or dynamics in their systems of interest, often translating into movements and flows that define system structure and function. These kinds of models are part of a much wider trend in simulation which is referred to generically as agent-based modelling (ABM) of which cellular automata (CA) modelling represents a particular case. It is these models that comprise those presented in this book. In one sense, geosimulation is part of the sea change that has occurred over the last 25 or so years of modelling in both the physical and social sciences. In the mid 20th century, scientists tended to articulate their systems of interest as though they were organized and constructed from the top down. Systems theory and the systems approach that grew out of engineering and biology before and during the Second World War, was predicated on the analogy with systems that were closed and controlled by negative feedback and thus, quite well-defined and well-behaved. Generally these were systems that could be conceived of as being in equilibrium. Although deviations from the equilibrium state could occur, processes of negative feedback were always able to restore or move the system to a new equilibrium in smooth and tractable ways. This model of the world which came to structure much simulation in the 1950s and 1960s, was found to be wanting in many ways. Spatial systems such as those of concern in geosimulation, tend not to be in equilibrium in the same way that closed mechanical systems, the analogues of the systems approach, were. Cities, for example, are places of vibrant change, great diversity and heterogeneity. As they have become more complex as the wealth of their inhabitants has loosed constraints on social and spatial behavior, top-down equilibrium seeking models that represent systems at one cross-section in time, have appeared increasingly out of touch with both understanding and policy analysis. Moreover, these earlier models, particularly those used in city and transportation planning, were often highly aggregate in their treatment of populations, and inevitably the quest began to disaggregate them to a level where at least individual groups could be defined that represented more consistent average behaviors. For example, aggregate spatial interaction models built around analogues with classical physics, often referred to as social physics, gave way to discrete choice and thence activity models of travel behavior while demographic processes were disaggregated to the point where techniques of micro-simulation became their modus operandi. Despite these trends towards finer and finer disaggregation, the notion of developing dynamic behaviors of relevant population groups has forced the field to consider models with purposive behavior. As population aggregates are fractured into ever greater detail, there comes a point where they reach some elemental level which is, in itself, self-contained with respect to its behaviors. In simulating mobility, for example, this is at the level of the pedestrian or the vehicle whereas for spatial objects such as the space itself, then it is the cell that can take on this relative independence from the aggregate. The sea change that has occurred in how we perceive spatial systems is reflected in this switch from top down to bottom up. Agents rather than their aggregates now constitute the key elements in model representation with the processes that engender their change through time and over space being the focus of simulation. Agent-based models have thus come firmly onto the agenda with variants such as cellular automata and more relaxed versions of these in the form of cell-space and cell-state models now forming part of the conventional wisdom. These new models that constitute the heartland of geosimulation, are much richer than their more aggregate, cross-sectional equilibrium-seeking counterparts. As such, they are much harder to validate against data in that they embody many processes that are plausible but for which data is rarely available. Indeed, process-based models are extremely difficult to fit unambiguously for usually data about key processes has to be assumed or is not available and somewhat indirect methods are thus required to validate the model against whatever data and assumptions are made explicit. This book develops many of these challenges presented first in chapter by Marceau and Benenson which deals with key issues facing the field. In essence, these challenges relate directly to the ‘geo’ in simulation, focusing on spatial representation, model validation, visualization and dynamics which are dealt with in the sequence of seven chapters that constitute the bulk of this book. In fact, in a number of the chapters, all these various themes are interwoven but in the first two chapters, the focus is on spatial representation. CA models invariably define spaces based on regular tessellations such as grids in 2-dimensions, occasionally 3 (for urban and environmental systems) but in the strict applications of these automata, neighborhoods around cells are defined in the most limited sense. Indeed emergence in such models as in the evolution of fractal patterns and forms can only be guaranteed if neighborhoods based on nearest neighbors are used. In spatial systems however, there is a need to overlap neighborhoods, to relax their extent to cover more than their nearest neighbors and to deal with hierarchies of cells. In a model for the Dublin region, White, Shahumyan, and Uljee develop what they refer to as a variable grid model that seeks to deal effectively with these concerns. In a related chapter which follows, Moore demonstrates how the regularity and homogeneity assumptions of the grid (which is largely fashioned after raster representations in GIS) can be relaxed to non-regular shapes. In this, rasters are replaced by vectors and he demonstrates how such irregularities can be produced in visualizing von Thunen's model of agricultural land use where concentric rings are replaced by irregular zones that require iteration in the solution of the model. This is an intriguing demonstration of the effect of agents modifying their own geometric surroundings and it opens the door to the notion that geosimulation models might also be developed so that agents actually define the spatial system on which they operate rather than simply engage in processes that take place on a fixed representation. Issues of visualization are always central to geosimulation for the focus on space and its complexity is intrinsically visual. In complex models, Mandelbrot’s long standing dictum that ‘the fit of the model is in the seeing’ is a benchmark that guides research and development. To this end, there are three chapters in this book that follow this discussion on representation and these focus on geo-visualization, particularly on the construction of geographic virtual environments, on 3-D representations, and on the use of multimedia in both the scientific development and the dissemination of outcomes. Crooks, Hudson Smith, and Patel present a portfolio of model applications involving multi-agent systems that are urban and spatial in intent, focusing largely on agents that move in urban space such as pedestrians and vehicular traffic. They show how 3-D representation and motion can be used as building blocks for embedding such models into virtual exhibition spaces and show how relatively straightforward it is to build models in scripting languages such as Repast and Netlogo which produce outputs that can be immediately visualized in interactive virtual worlds. A nice feature of these models is that users can enter the scene as avatars and mix with virtual agents, thus involving real time interaction of real with modeled behavior, opening up possibilities of models that are mixtures of the real and the virtual. Mekni, Moulin, and Paris ground these ideas in more structured contexts by building semantically-enhanced virtual geographic environments. This is a rather different approach to agent-based modelling than the usual one which seeks to visualize outcomes rather than exploit visualization capabilities for the very behaviors that are being simulated. In short, embedding virtual geographic environments within the decisions that agents make with respect to their spatial behaviors turns the problem on its head: visualization is being used here to extend the behavioral abilities of agents as well as inform the model-builder as to agent behaviors and behavioral outcomes. In some senses, this is the wave of the future where visualization of the cellular space in which agents behave becomes the focus of the simulation itself. In the next chapter, Heckbert and Bishop change the focus to the empirical calibration of agent-based models but embed these in various visual environments, thus picking up on ideas from the previous two chapters. In fact visualization is one of the key ways in which validation is developed in these models. Three data-based approaches to validating agent model are developed for landscape problems, with three models being developed, the first using discrete choice survey to estimate the parameters of an ABM from survey data, the second using participatory approaches to reveal preferences for locational activity, and the third using data extracted from an experimental economics-like setting which is used to tune similar kinds of model. In all these examples, the key problem of reconciling observed data on outcomes with implied data on processes is identified, showing how important it is to get to grips with the problem of validation in such models. The implication of their work is that models should be tuned to available data, not the other way around and that model specification should be flexible to the validation process: changing the model is likely to be as important a strategy in geosimulation where the goal of parsimony in model design will always be problematic, as finding data that represents as many aspects of the model as possible. This emphasis on validation is then continued in more conventional terms by Hatna, and Benenson who extend their work on residential segregation in ethnically diverse cities using the distribution of incomes. In essence, they extend and enrich Schelling’s (1969) model of residential segregation, departing somewhat from Schelling’s demonstration that high tolerance levels for dissimilar populations in their immediate neighborhoods can lead to serious segregation and a low level of diversity. In their examples for Israeli cities, they find the opposite and thus they operationalize the model using ideas about income distributions. One of the key features of their approach is that amongst many ABMs and much geosimulation, their work stands out as being empirically robust in that they have extensive data on outcomes, if not on the processes that lead to these outcomes. Once again they show the way in terms of model calibration and validation. The last chapter by Straatman and Marceau takes geosimulation to a new realm: they develop models of what they call ‘open-ended’ agent-based economic evolution where the focus is entirely on processes that do not close on final outcomes. Models of an evolving economy are used and made tangible through input-output structures that enable new technologies to be produced and diffused. In some respects, the traditions that draw on might be called econo-simulation rather than geosimulation and although their models are a-spatial at best, they do open the way to enriching the field of geosimulation with ideas from agent-based computational economics and, like Heckbert and Bishop before, to ideas from experimental economics. This, in many ways, is a fitting conclusion for it throws wide open the idea of geosimulation and impresses upon the reader the dynamism and curiosity that is central to the ideas developed here. These interesting and informative contributions mark out the frontier in geosimulation in particular, and in cellular automata and agent-based modelling in general. Readers will gain much from what follows and the editors are to be applauded for collecting together a set of chapters that inform and extend the state of the art. The online presence of these contributions will ensure that these ideas will be available to a potentially very wide set of interests. Benenson, I., and Torrens, P. M. (2004) Geosimulation: Automata-Based Modelling of Urban Phenomena, John Wiley, London. Schelling, T. C. (1969) Models of Segregation, American Economic Review, 59, 488-493. The desire to understand our world and foresee its future is embedded deeply in the human mind. Starting from the 1960s, our forecasts are based on computer simulations. New computing facilities enforce the development of novel methods of scientific inquiry and enable the investigation of problems that only a decade ago were considered overcomplicated. As part of this computer-based evolution of science, Geosimulation has recently emerged at the intersection of Geographic Information Science, Complex Systems Theory and Computer Science. Geosimulation aims at understanding the dynamics of complex human-driven spatial systems through the use of spatially explicit computer simulation. Geosimulation sees dynamic spatial systems, such as cities, as consisting of, and driven by, the human agents; the system's dynamics becomes, thus, the synergetic output of agents' actions and interactions. Numerous human agents behave in urban space pursuing their goals and the model simulates their spatial, social and economic activities. In this way, Geosimulation model becomes a laboratory for exploring complex human systems and their possible paths of development and evolution. The perspectives of Geosimulation are defined by the advances in representation of geographic space and analysis of spatio-temporal dynamics of human-driven systems including emergence, path dependence, hierarchy and multi-scale dependency. The approaches and tools for validating Geosimulation models are especially important for understanding their complex and spatially heterogeneous outcomes. This book originates from a kind invitation of Bentham Science Publishers and their new publication venture of electronic books. The Advanced Geosimulation Models pursues Itzhak Benenson's and Paul Torrens' 2004 book Geosimulation – Automata-Based Modelling of Urban Phenomena in which they defined the field of Geosimulation and provided a thorough assessment of its potential contributions for the urban and related phenomena. 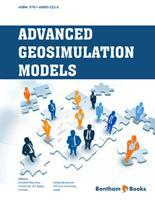 Considering the growing influence of Geosimulation on several disciplines, this book aims at presenting to the scientific community the recent conceptual and methodological advances achieved in the field. The book targets scientists and graduate students working in the fields of Complex Systems Modelling, Geocomputation, GIScience, Geography, Regional Science, Computer Science, Artificial Intelligence, Environment Simulation and Modelling, and Environmental Engineering who are developing geosimulation models and who want to learn about the recent developments in the field. It will also be of interest to practitioners attracted by the potential of Geosimulation for managing complex urban and environmental problems. We want to thank all of those who have contributed to the realization of this book. We are grateful to all the authors who have responded enthusiastically to the invitation of providing a high-quality manuscript. We deeply appreciate the external reviewers for their constructive comments. Finally we thank the people at Bentham Science Publishers, and, especially, Ms Sara Moqeet, Assistant Manager of the E-books Publications Department, for her patience and support during the production process of this book.